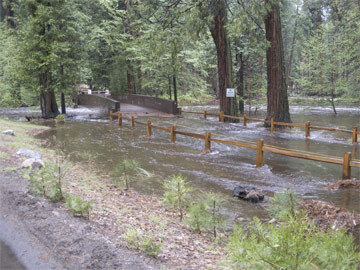 High water is causing flooding in some Yosemite Valley areas, including campgrounds, parking areas, some lodging facilities, and picnic areas. Larger than usual snowpack, warm weekend weather, and rain have all contributed to higher than usual water levels. Safety concerns, including road flooding and possible infrastructure damage, have prompted Yosemite National Park officials to close Yosemite Valley temporarily to traffic. In addition, all East Valley campgrounds are closed until further notice. Other areas in Yosemite National Park, including Wawona and areas off of Highway 120 west including Big Oak Flat and the Merced and Tuolomne Groves of Giant Sequoias will remain open until further notice. Glacier Point Road and Highway 120 East (Tioga Road) are still closed. Visitors are advised to check weather and road conditions before coming to Yosemite National Park. Information can be obtained at 209/372-0200 or on the park website at www.nps.gov/yose. Visitors with lodging reservations should contact Delaware North Company, Inc., at 559/ 252-4848 to check on current conditions.